Although I have many photos of the outside of Splash Mountain, I have far fewer on the ride itself. This is mainly because I wanted to keep my iPhones dry. However, my latest one is water resistant, so I took quite a few pictures while riding last night. 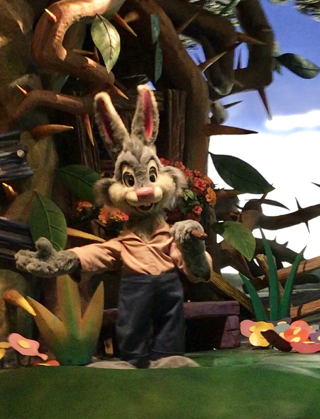 Here is one of Brer Rabbit. 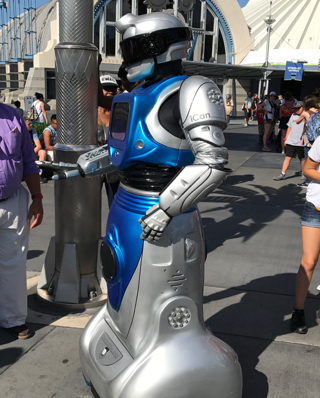 I ran into this robot from outer space in Tomorrowland today. This recent Magic Kingdom addition interacts with guests throughout the day. Since "Push" the trash can has left the park, there hasn't been much in the way of interactive, guest experiences. iCan seems to have added some fun to the area. 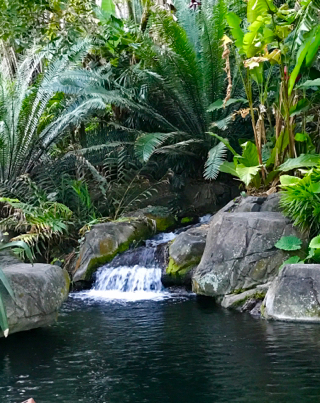 There are so many little "quiet" spots to be found around Animal Kingdom. This brook is located next to a small path that runs parallel to the main walkway between Asia and Africa. There is also a small seating area nearby, which is a nice place to take a break. I always like to take unique "on-ride" photos when possible. I took this shot near the top of the second lift hill. You can see another train, as well as Cinderella Castle in the distance. 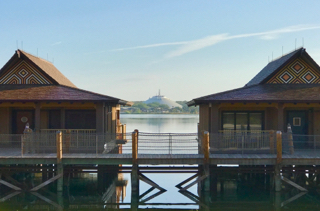 The Polynesian Bungalows are unique accommodations on the shore of Seven Seas Lagoon. They each sleep up to 8 adults, and they have a spectacular view of the Magic Kingdom fireworks. I took this shot last week. You can see how I used two Bungalows to frame Space Mountain in the background. Today, I visited some good friends at one of my favorite resorts, Animal Kingdom Lodge. Their villa was in the Kidani Village section, and this was the view from their balcony. 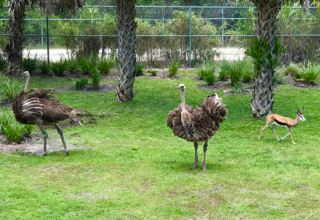 These are two of the biggest ostriches I have ever seen. The 2017 Flower and Garden Festival is past the halfway point, and I headed to Epcot a few days ago to take some more pictures. There are so many great topiaries this year, which make for excellent photo opportunities. 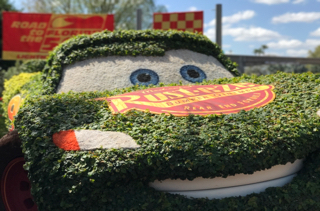 This Dale topiary can be found on the main walkway between Spaceship Earth and World Showcase. I don't post too many pictures of food, but this is one of my favorites. 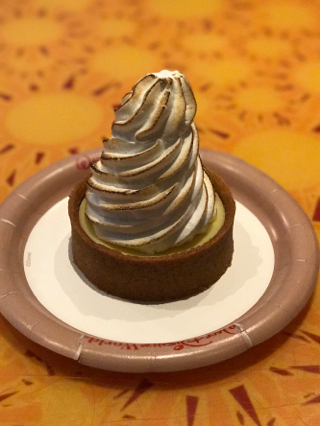 This delicious dessert is the Key Lime Tart from the Sunshine Seasons food court in the Land Pavilion at Epcot. I took this shot a few days ago while doing some exploring at the Flower and Garden Festival. Although it sells modern day treats, the General Store in Frontierland is very well themed to the "old" West. 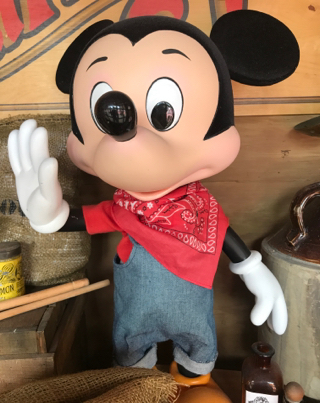 This Mickey stands in the main window display of the store. I took this shot today, while giving a Magic Kingdom tour. 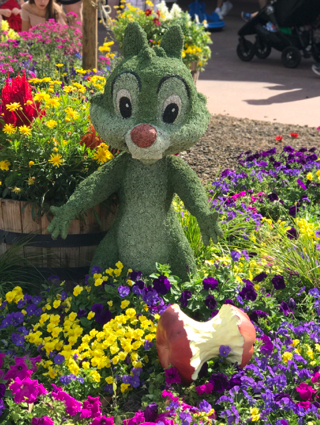 The Epcot Flower and Garden Festival has a pavilion called Tinker Bell's Butterfly House. 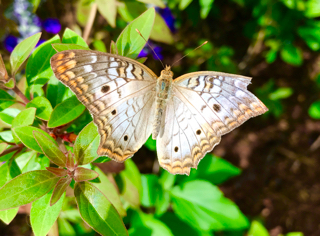 It is a great place to enjoy and learn about butterflies. I took this closeup shot this afternoon. At last check, there are an average of six weddings per day at Walt Disney World. Many of them are performed at the Wedding Pavilion at the Grand Floridian. 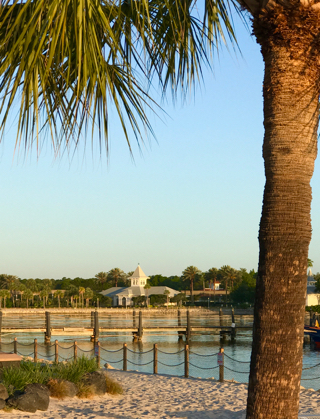 I took this shot from the Polynesian beach yesterday. Pinocchio village house is one of the quick service restaurants in the Magic Kingdom. It is very well themed to the 1940 film. This wall can be found near the exit door leading to the restrooms. 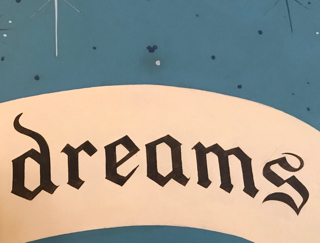 If you look directly above the letter "a" in the word dreams, you'll find a small, dark, hidden Mickey. I spent some time at the Polynesian Village resort today. 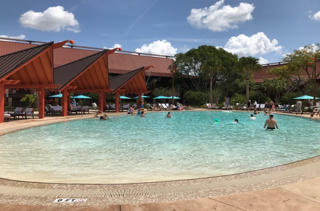 Although the volcano pool is one of the most popular on Disney property, the other pool at this resort is also very nice. It has a "zero entry" area, some private cabanas, and even a full service bar and walk-up quick service restaurant. The other perk of this pool, is that it is usually less crowded than the volcano pool. There are many statues, structures, and figures in Adventureland that appear to be stationary, but actually come to "life" at times. A Pirate's Adventures is an experience, where guests interact with these objects using their Magic Band or a magic talisman. This statue is near the stairs to Jungle Cruise. You can see that it's mouth opens and eyes turn green when someone interacts with it. We are approaching the 40th anniversary of the Star Wars franchise, and it is a pretty big deal in Central Florida. There is a huge celebration taking place in Orlando this weekend, and Hollywood Studios continues to be the place to be for all things Star Wars. 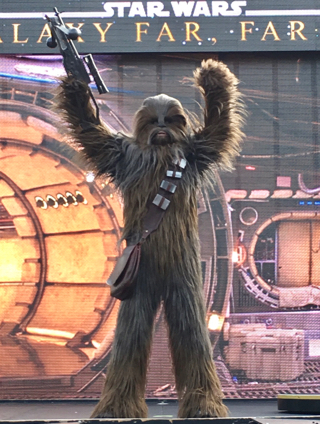 I took this shot of Chewbacca during the "Star Wars: A Galaxy Far, Far Away" show, in the center of the park. 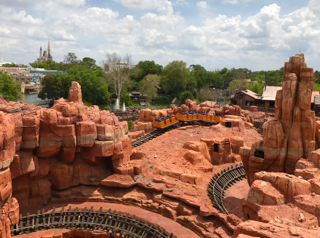 The Seven Dwarfs Mine Train is still one of the most popular attractions at Walt Disney World, with wait times often exceeding 2 hours. At the end of the ride, the coaster passes by the dwarfs' house. Inside the house are several figures that were taken from the old "Snow White's Scary Adventures" ride. 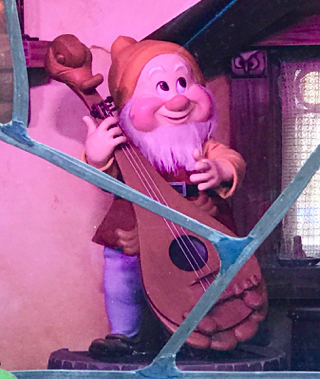 I took this shot of Happy Dwarf a few weeks back, while riding the Mine Train. 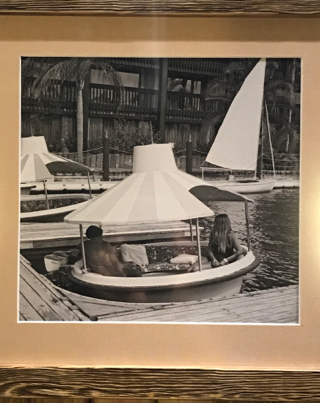 While walking thru the Polynesian this morning, I noticed this photo in a hallway near the lobby. It was obviously taken in the 70s, shortly after the resort opened. Although I visited Walt Disney World in the late 70s, I don't remember seeing these cabana style boats on the Seven Seas Lagoon. The Adventureland attractions are known for containing many animals. There are the wild ones on the Jungle Cruise, the birds in the Tiki Room, and even a bunch in Pirates of the Caribbean. 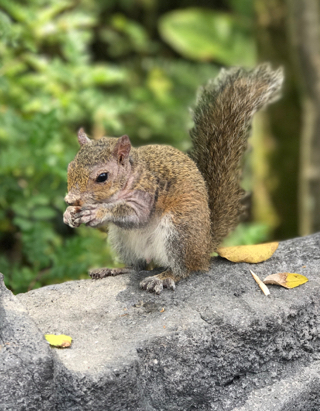 However, this "real" squirrel was just hanging out on a wall near the Swiss Family Treehouse when I snapped this shot. Future World East is the area of Epcot where you will find Universe of Energy, Mission Space, and Test Track. 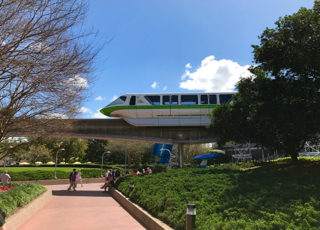 The monorail heads thru Future World East when it enters the park, and continues thru Future World West just prior to arriving at the station. I took this shot near Test Track a few weeks ago. 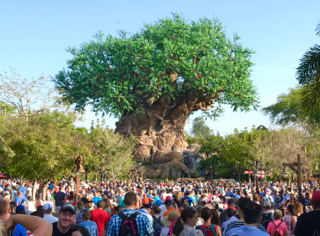 The Tree of Life is a beautuful park icon as well as an amazing engineering feat. It is 145 feet tall and has over 325 animals carved into it. It was built over an offshore oil rig, and can withstand hurricane force winds. I took this shot at park opening time. You can see from the massive crowd that this is spring break season. The Epcot Flower and Garden Festival has so many good topiaries this year. One of the best is the full size Lightning McQueen that can be found in the area of Test Track. I took this shot in "portrait mode," which is a fun new feature on the latest iPhone. The Columbia Harbour House is one of my favorite spots for lunch, when I'm giving a Magic Kingdom tour. The upstairs seating area gives guests some interesting views outside of the windows. 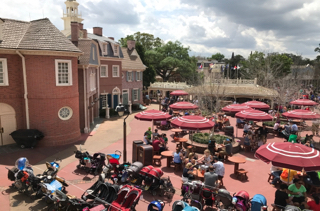 I took this shot of the area adjacent to Hall of Presidents in Liberty Square from a west facing window of the restaurant. The Maharajah Jungle Trek is best known for its tigers. 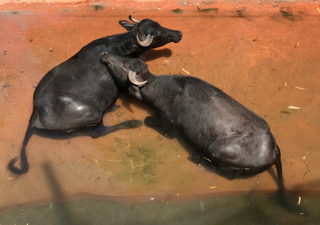 However, there are many more animals in this area, including water buffalo. There are three of them in total, and I was able to get a shot of two that were in plain sight. The third was just out of view of the camera. The three water buffalo are named Dorothy, Rose, and Blanche, after TVs Golden Girls! 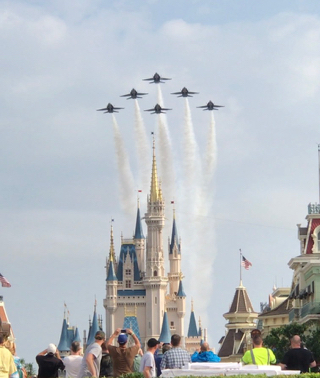 Yesterday morning, the Navy Blue Angels did two "fly-bys" over the Magic Kingdom. They are in the area for an air show this weekend. It was quite a thrill to see them directly over Cinderella Castle. 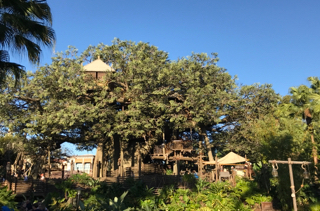 Disney recently completed a refurbishment of the Swiss Family Treehouse. They removed much of the foliage that previously blocked the view from the Jungle Cruise area. I took this shot from the Jungle Cruise steps this afternoon. 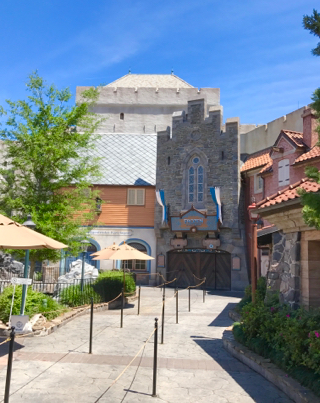 Named for a castle in Oslo, Norway, Akershus is a popular "princess" dining spot in Epcot. 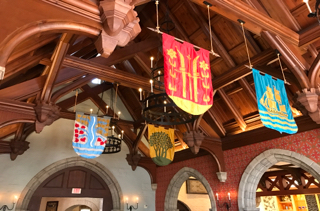 It has a medieval feel with giant wooden beams and large flags hanging from the ceiling. I took this shot while my tour guests were enjoying lunch at the restaurant this past weekend. 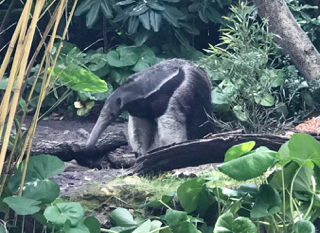 In the past, one of the first animals that guests would encounter at Animal Kingdom was an anteater. 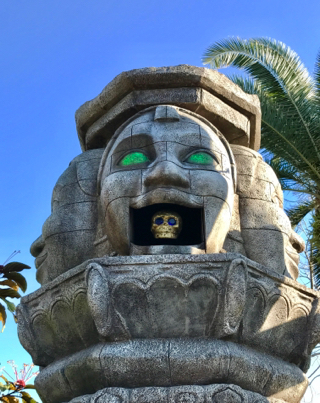 He was located on the left side of The Oasis, not far from the park entrance. However, it has been a while since an anteater was last seen at this park. But, a few days ago, a new one arrived and I was able to snap this photo of him. Epcot's "Frozen Ever After" is currently one of the most popular attractions in Walt Disney World. It is very difficult to get FastPasses, and wait times often exceed 90 minutes. Getting a photo of the entrance without any people can be a challenge. However, this ride had a maintenance issue and was temporarily closed. There were dozens of guests standing behind me, anxiously waiting for the attraction to re-open. When giving Animal Kingdom tours, I always enjoy taking my guests through Gorilla Falls Exploration Trail. In addition to the gorillas, there are hippos, zebras, and some interesting birds. 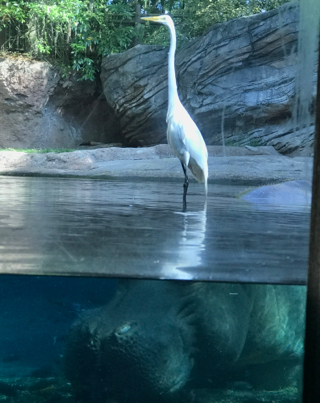 Today, we saw a great egret standing on the head of this sleeping hippo. 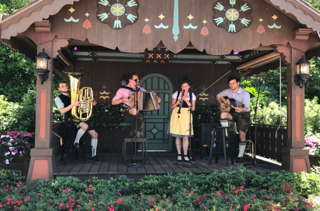 While walking by the Germany pavilion in Epcot today, I stopped for a few minutes to listen to the new Bavarian folk band. This quartet is called Wies N Buam, and they play seven sets per day. They are one of several new live groups that entertain World Showcase guests on a daily basis.